Dr. Mark E. Richards of Ageless Impressions explains how incorporating multiple modalities for a customized facial rejuvenation experience offers enhanced, longer-lasting benefits. 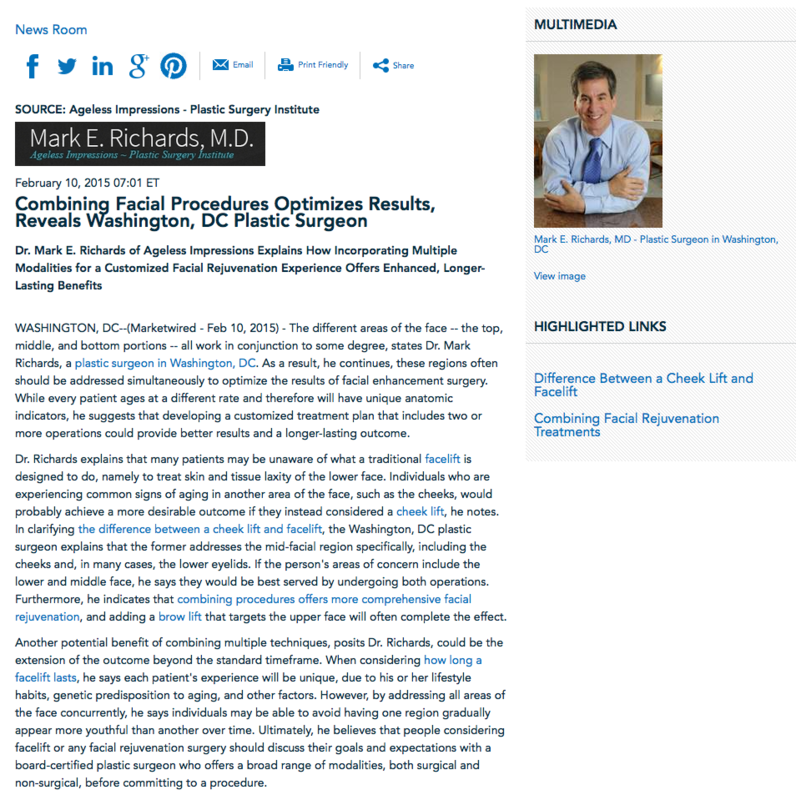 Washington, DC—The different areas of the face—the top, middle, and bottom portions—all work in conjunction to some degree, states Dr. Mark Richards, a plastic surgeon in Washington, DC. As a result, he continues, these regions often should be addressed simultaneously to optimize the results of facial enhancement surgery. While every patient ages at a different rate and therefore will have unique anatomic indicators, he suggests that developing a customized treatment plan that includes two or more operations could provide better results and a longer-lasting outcome. Dr. Richards explains that many patients may be unaware of what a traditional facelift is designed to do, namely to treat skin and tissue laxity of the lower face. Individuals who are experiencing common signs of aging in another area of the face, such as the cheeks, would probably achieve a more desirable outcome if they instead considered a cheek lift, he notes. In clarifying the difference between a cheek lift and facelift, the Washington, DC plastic surgeon explains that the former addresses the mid-facial region specifically, including the cheeks and, in many cases, the lower eyelids. If the person’s areas of concern include the lower and middle face, he says they would be best served by undergoing both operations. Furthermore, he indicates that combining procedures offers more comprehensive facial rejuvenation, and adding a brow lift that targets the upper face will often complete the effect. Another potential benefit of combining multiple techniques, posits Dr. Richards, could be the extension of the outcome beyond the standard timeframe. When considering how long a facelift lasts, he says each patient’s experience will be unique, due to his or her lifestyle habits, genetic predisposition to aging, and other factors. However, by addressing all areas of the face concurrently, he says individuals may be able to avoid having one region gradually appear more youthful than another over time. Ultimately, he believes that people considering facelift or any facial rejuvenation surgery should discuss their goals and expectations with a board-certified plastic surgeon who offers a broad range of modalities, both surgical and non-surgical, before committing to a procedure. Dr. Richards graduated from Yale University with honors before continuing on to medical school at the University of Maryland. He then completed seven additional years of training in both general and plastic surgery. Certified by the American Board of Plastic Surgery, he is also an active member of several distinguished medical organizations, including the American Society of Plastic Surgeons, and has received numerous accolades, such as being named one of America’s Top Surgeons by the U.S. Consumer’s Research Council every year since 2002. Dr. Richards is available for interview upon request.